Inder Loves Folk Art: My new obsession. 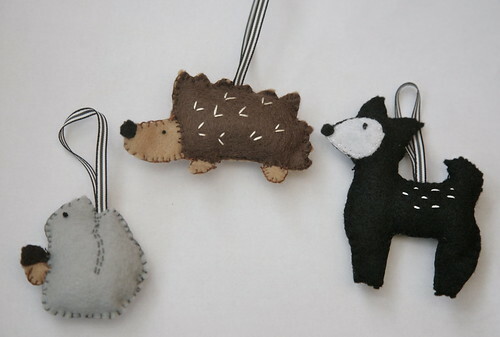 Felt ornaments. These are so fun! And crazy inexpensive! And addictive! Okay, I'm in love with the little hedgehog! Too cute! I really like the squirrel! (I find it hard to understand the people who fervently believe squirrels are evil, they are so dang cute and have such funny little personalities IMHO.) I've begun to have a lot of fun making felt play food. Today was my first project, two fried eggs. It is a bit addicting, which is good because I am now on bed rest.I can't wait to see what other ornaments you come up with! These are really cute - and a whole tradition is born! I need a hedgehog!!! Might have to steal your stealing.